“What are you aiming for today?” Valley Strider teammate Rob casually asked me as we jogged our warm up in the pouring rain before the Brass Monkey half marathon in York this morning. “Oh, sub 1.25 I guess, but I’d be happy with a PB – sub 1.27.39”. OK, I’ll admit it. I sandbagged him a bit here, but when asked such a question it’s just in my nature to under-promise and then over-deliver. After all, one would look a bit of a fool if you stated your real target and then missed it by 3 minutes wouldn’t one? If I had been totally honest, I would have said that 1.23.30 was a good target for me today. If all went really well, then maybe I could just nick under 1.23. 1.25 would have been OK, anything slower, a disappointment. I was amazed and delighted to run a time of 1 hour 20 minutes 27 seconds – a personal best best by seven minutes and 12 seconds (though I haven’t run many half marathons). I still can’t believe I ran that quickly. I love running for a number of reasons. One of the main ones is that I always wonder how fast can I go? how much can I really push myself. To run well in a long distance race one experiences discomfort, then severe discomfort, then pain, then more pain and it just gets worse. You have to embrace the suffering, challenge it and dismiss it, overcoming your inbuilt systems that are screaming at you to slow down, to end the pain that you are putting yourself through. Professor Tim Noakes was interviewed on Marathon Talk a couple of years ago. He says that the mind is the primary determinant of athletic performance. He calls it ‘central governor theory’. In the interview with Tom Williams he asked us to imagine two runners entering the stadium together at the end of the Olympic Marathon. You have the winner and the one that decides to come second. That’s right – one of them effectively gives in. After all, he was able to stand on the podium to collect his silver medal. He didn’t push himself absolutely as far as he could. He didn’t collapse or die. His central governor prevented this. Professor Noakes thinks that controlling the central governor is one of the key challenges in maximizing performance. I think there is a lot to learn from this. Thinking back on my own modest athletic career, my best ever performances have always happened when my mind has been strong, when I have not looked at the watch but just raced my fellow competitors. I can remember running my first ever sub 18 minute 5K last September. Just when I was really hurting, after about 3K, when my lungs were burning and my mind was in the state of doubt and confusion, when I thought I was about to give up and slow down to relieve the agony – an older guy came cruising past me. I couldn’t believe it. Right then I decided that I would beat him, whatever it took. For the next 1.5K I hung on to him for all I was worth, it was torture, excruciating, but I did it – I sprinted past him with 500 metres to go. Various thoughts go through a runners mind at the start of race – how far back should I be from the line? do I feel good today? My main thought is how fast should I run each mile? One wants to deliver the maximum effort over the full distance and the best performance will nearly always come from a consistent pace throughout the race. If you go too fast early and blow up, you can lose loads of time, better to go just a little too slow and finish strongly – and you will have the added bonus of passing other runners in the latter part of the race, always great for morale – but then, did you really give it everything? I did feel great, I was clipping along at just over 6 minute miling, running nicely on my toes and steadily passing runners all the way. I went through 10K in under 38 minutes and was through 10 miles in 60:56 (a 10 mile PB by 1 and half minutes!). Of course, it was getting harder all the time, however, I decided to really commit. I was helped by following a guy in a pale blue vest who was running a perfect speed to pace me – just a tiny bit quicker than felt comfortable, but he never slowed such that I could go past him. At about 6 miles we caught my teammate Rav from Valley Striders. Rav is usually much quicker than me – his 10K PB is well under 37 minutes. I decided to be really positive and go straight past him, rather than latching on and running with him. He didn’t take it lying down! a mile later he came past me strongly, this time I followed him. We were really bouncing along – at one point I looked down at the Garmin and the mile pace was showing 5.50! – gulp, that is a bit too fast! I hung on for all I was worth. After we turned back onto the long straight road back to the racecourse, at about 10 miles I had another go, I put in an effort and I heard him swear and I moved away, I thought that if I could keep the effort going I would have him. I knew I was on for something special – a huge PB. 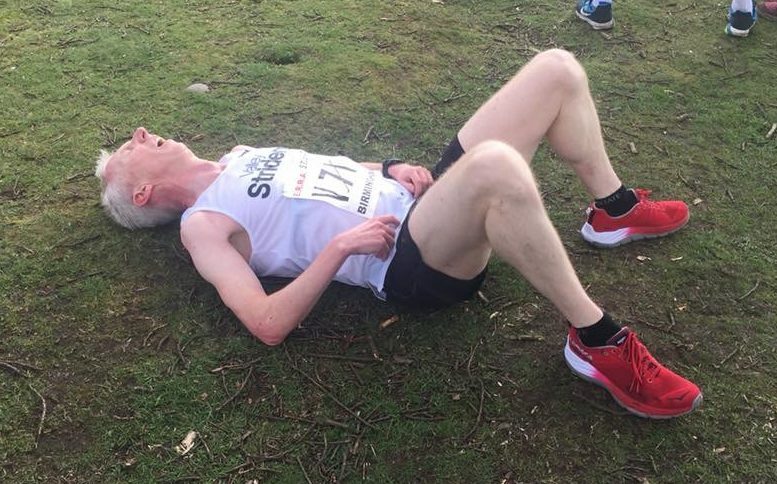 I tried to do some mental calculations, never easy at 9 miles in a half marathon with spittle dribbling on your chin – if I could maintain the pace I would very close to running sub 80 minutes! Oh my, now that would be something. Maybe I lost a little focus; but probably the speed, the effort and the lactic acid started to get to me. My mind started to think about the pain more than the performance, “Come on!” I urged myself inwardly and a couple of times I even shouted it audibly. There are two small climbs in the last two miles. Well, in reality, they are just bridges up and over the railway and then the A64, hardly climbs, but when you are on the rivet they really hurt. Up the first climb I sensed Rav behind me again – drat! he probably sensed I was weakening and he attacked me – this time I had no response – he moved away, I just couldn’t summon up anything with which to follow him. I was isolated in the last two miles so I made my way home as best I could. The last two miles were covered in 6.18 and 6.14, so the wheels didn’t come off, but the 1:20 time was now out of the equation. I crossed the line in 1:20:36 (gun time) – my chip time was 1:20:27; about 20 seconds behind Rav. After the line I was as close as I have ever been to throwing up at the end of a race. It took a good 5 minutes for me to find any composure. In the context of my marathon training, this was a huge confidence booster. A sub three hour marathon off a 1:20 half should be very achievable, but as all runners know, you are only an injury away from disaster, so I must keep my head in check and keep on with the consistent training. There are still 11 weeks to go, so its vital that I keep doing the miles, with more long runs to come and at least one hard interval session a week. The other exciting news this week is that I have the opportunity to run a marathon in Sierra Leone on May 25th. It came up on the Intranet at work – the marathon is organised by a charity called Street Child and it is always well supported by the insurance community, especially within Lloyd’s of London (I work for a Lloyd’s syndicate). I have expressed my interest, but haven’t committed yet, though I think I will. It could be an amazing experience – I have never been to Africa, I’m sure I will meet some great people and I love going to places that are very different from my normal British middle class life. Aside from the distance, the heat will be a massive challenge for me. I have always struggled in the heat and it is expected to be over 30 degrees by the end of the marathon. It starts at 6 a.m. when it will be a little cooler but still very warm and humid. Its run mainly on red dirt tracks through villages in the bush. It won’t be cheap – its about £400 to enter (this includes ‘basic’ accommodation), but incredibly there is a budget airline that flies to West Africa called Gambia Bird, so flights are about £400-£500. Three of my colleagues from London and the U.S. have put their name down also. Should be interesting!